Symposium participants: In the Shadow of the Hand, Sacha Kahir, Caleb Waldorf, Max Andrews of Latitudes, Angeliki Roussou, WHW (What, How and For Whom?). The Shock of Victory is a programme consisting of an exhibition, a symposium organised in partnership with the University of Edinburgh and digital publication. Taking place exactly one year after the Scottish Independence Referendum of 18 September 2014, the programme proposes artistic approaches, techniques, provocations and motivations in a post-referendum reality departing from Scotland, but certainly not constrained by it. The programme takes its title from the pivotal essay ‘The Shock of Victory’ from 2007, by anarchist and scholar David Graeber, in which he argues that protesters often have difficulty in recognising their moments of success. Accompanying the exhibition the symposium allows for a timely re-consideration of the complexities of the relations between alternative and established (art) institutions that might have been sparked by political moments such as the Scottish Independence Referendum of 2014. The underpinning emphasis is on the ‘organisational turn’, a shift from hierarchical to self-organised models of organisation. In particular the focus is on the potency of radical (artistic) practices and ideas, which propose imaginative ways of organising – collectivism, anarchism, activism, networks, and self-organising. Can we think of a new artistic landscape that might have been formed? How do we organise ourselves in such times? Article by Max Andrews published in Frieze, October 2013. Max Andrews from Latitudes will offer a perspective on recent cultural politics in Barcelona. 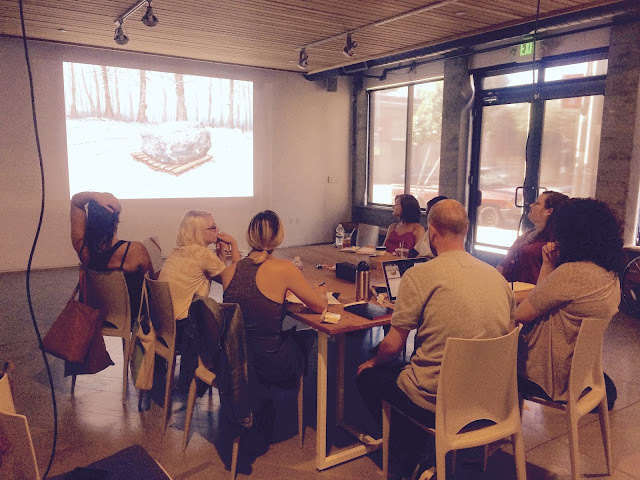 Looking in particular at visual art institutions, the 'open submission' format has become a pervasive tool. As an extraction of a democratic process, such an apparently accountable mechansim can nevertheless be complicit in a neo-liberal agenda, undermining institutional robustness and advocating continual 'present-ness'. Other independent and self-organised realities do of course exist, and following recent municipal elections the political tide offers the promise of change. 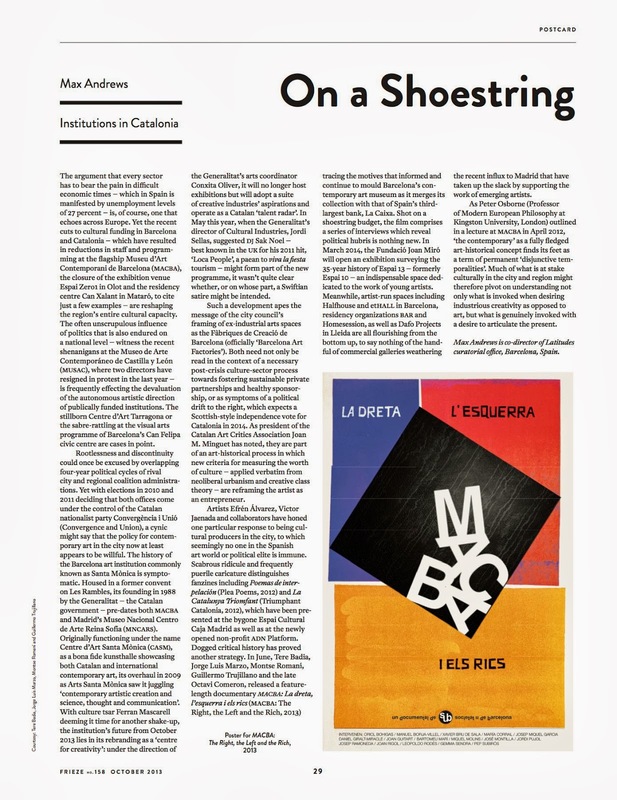 With reference to art practices that have connected with specific moments of Catalan social history, some contemporary case studies show a thinking around site, scale, longevity and depth – and perhaps reveal a connection with Scotland. Co-convened by Dr Deborah Jackson. Recognizing that not everyone can visit Kadist Art Foundation venues in Paris or San Francisco, Kadist recently inaugurated a series of online projects with artists and curators around the world. First of these initiatives is the One Sentence Exhibition (OSE), for which the foundation invites curators to write or choose a single sentence, making each word in the sentence a hyperlink to an image, video, text or website. 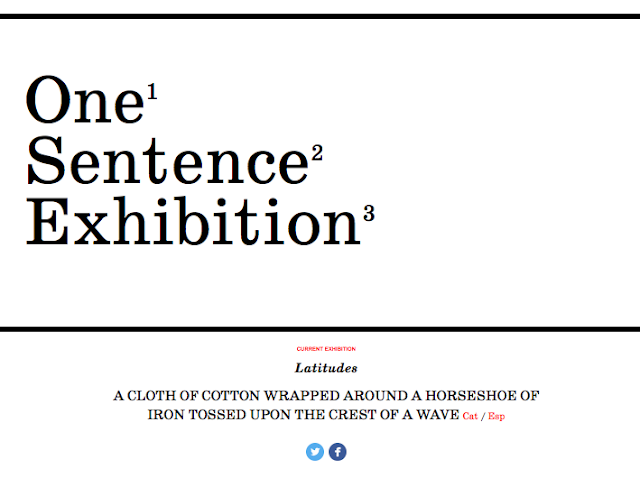 As a result, the One Sentence Exhibition becomes a compact architecture, accompanying the reader as they explore far-reaching corners of the internet. 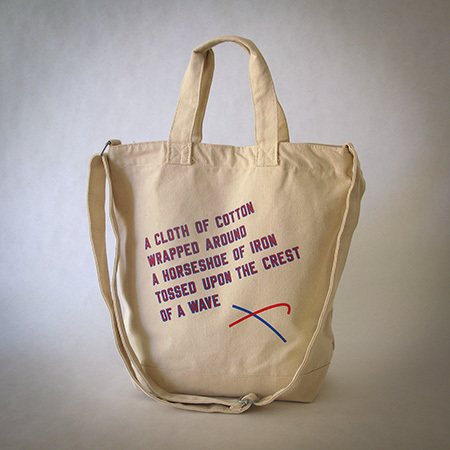 Following on from the contributions by Rudolf Frieling (Media Arts Curator at SFMOMA) and Nato Thompson (Chief Curator at Creative Time) to OSE series, Latitudes has chosen the statement "A CLOTH OF COTTON WRAPPED AROUND A HORSESHOE OF IRON TOSSED UPON THE CREST OF A WAVE" by Lawrence Weiner in English, Spanish and Catalan, commissioned for his 2008 solo exhibition THE CREST OF A WAVE at the Fundació Suñol in Barcelona. Sugar packets where freely distributed during the duration of the exhibition around Barcelona. Photo: Pierre-Jean Moulis. Originally distributed as a free ephemeral sculpture on 300,000 sugar sachets and presented on the wall of the exhibition space, Weiner’s striking typographic rendition of the statement triggers a chronicle of mercantile, maritime and equestrian power, of trade and occupation, of spheres of influence and change, a memory of matter and of language. The statement is also silkscreened on the commemorative limited edition tote bag that celebrated Latitudes' 10th anniversary in Spring 2015. Poster of the exhibition at Fundació Suñol's Nivell Zero space, Barcelona. cortado, carajillo, or conversation. 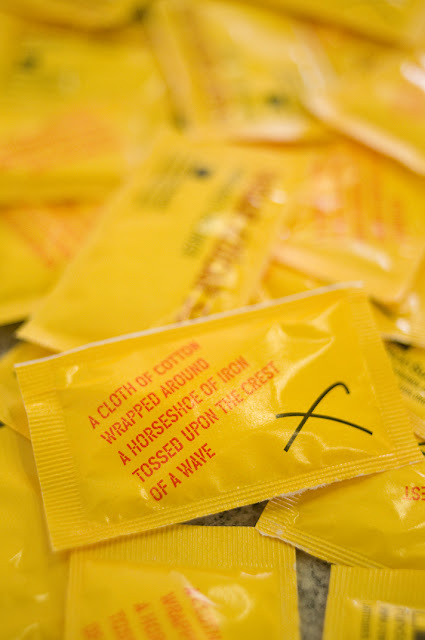 Printed on hundreds of thousands of standard 7 gram white sugar sachets – sugar production technology too was spread into Spain by Moorish occupation – Weiner’s striking typographic rendition of the phrase in red and yellow (the colours of both the Catalan and the Spanish flag) is accompanied by an emblem which evokes the trajectory of a certain horseshoe over a wave in diagrammatic form. View of Lawrence Weiner's piece at the patio space of Fundació Suñol, Barcelona. 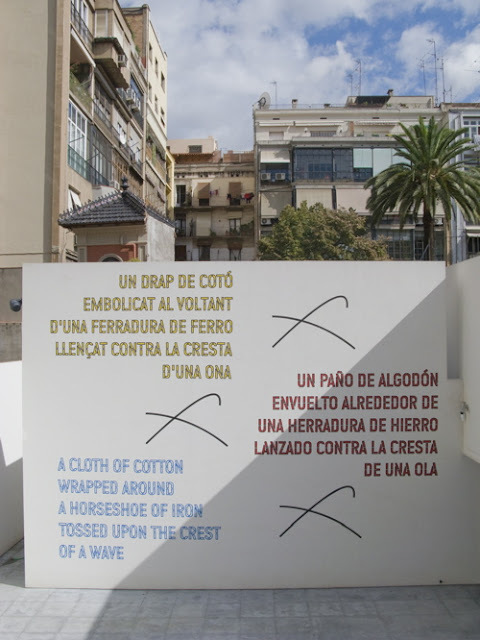 (...) On the five metre-high wall of the exterior space [of Fundació Suñol’s Nivell Zero] we read A CLOTH OF COTTON WRAPPED AROUND A HORSESHOE OF IRON TOSSED UPON THE CREST OF A WAVE painted in Catalan, Spanish and English. The use of the same stencil font as the sugar packet layout suggests a method of functional and clear application which reinforces the fact that Weiner is dealing with the language in terms of modification and use. The word for a company which produces typefaces – a foundry – neatly preserves a link to a time when type was cast from metal, in much the same way as horseshoes are made from iron." 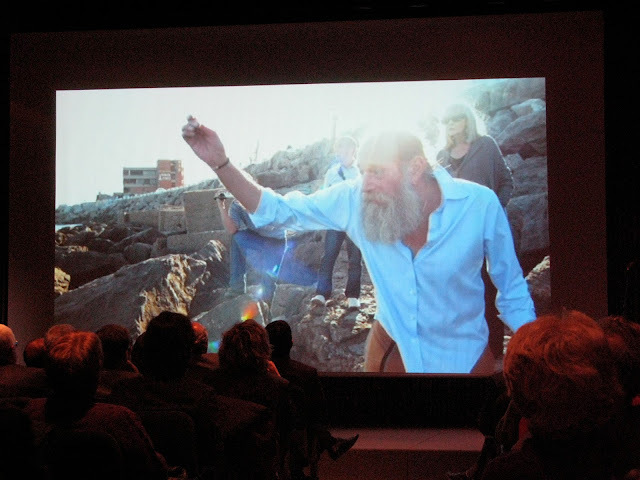 Ceremony of the 2008 ACCA (Art Critics Association) awards which granted Fundació Suñol the best art programme of the year – a season that included two projects curated by Latitudes. The font is FF Offline Regular, designed by Roelof Mulder in 1988.